"In a fair world, Rafe, nothing like us would ever be necessary. But we live in a very unfair world indeed." 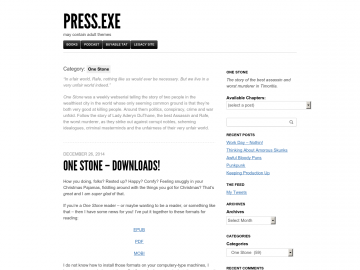 One Stone is a weekly webserial telling the story of two people in the wealthiest city in the world whose only seeming common ground is that they’re both very good at killing people. Around them politics, conspiracy, crime and war unfold. Follow the story of Lady Aderyn DuThane, the best Assassin and Rafe, the worst murderer, as they strike out against corrupt nobles, scheming idealogues, criminal masterminds and the unfairness of their very unfair world. One Stone has not been reviewed yet. One Stone has not been recommended yet.